Daniel Kraft ’11 took the long way home after graduation in May. 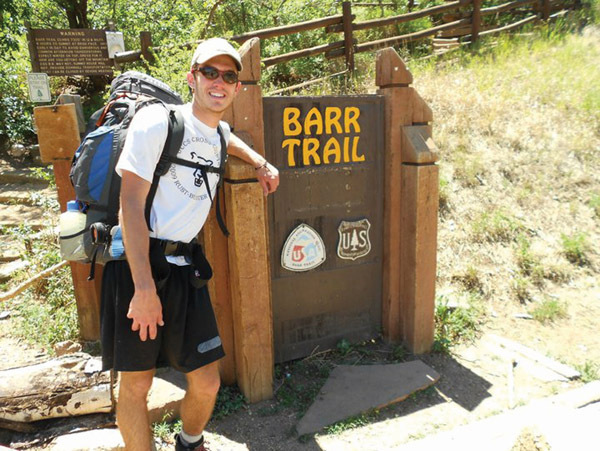 With a freshly minted diploma in hand, declaring him a graduate of Colorado College with a degree in chemistry, Kraft put on his backpack and started walking approximately 300 miles home to Grand Junction, Colo. He left CC on June 22 and headed west over Pikes Peak via Barr Trail, then down to Mueller State Park, Eleven Mile Reservoir, Salida, Tincup Pass, Taylor Park Reservoir, Crested Butte, Paonia Reservoir, Grand Mesa, and finally, Grand Junction. He arrived home on July 13. “I thought this was a perfect way to end my college career, to show that it really isn’t that far from home to college, even though it may have seemed so,” Kraft said. However, the Bulletin would not know of this “feat” if not for an encounter Kraft had with a CC alumna along the way.